Pattaya is a beach resort, located on the eastern gulf coast of Thailand. Just a 2 hour drive from Bangkok, Pattaya is located in the Chonburi Province, surrounded by the Bang Lamung District. Although Pattaya is situated in a heavy industrial eastern seaboard zone, the city attracts millions of pleasure-seekers from around the world. Well known for its colourful nightlife, Pattaya features an array of options, from a simple to the more discretionary activities available on trips to Thailand. Once a small fishing village, Pattaya started to develop in the 1960s, as it became the hub for rest and relaxation for American servicemen during the Vietnam War. Evolving into a popular beach resort, Pattaya’s fishing huts were soon replaced with hotels and retail stores, including Asia’s largest beachfront mall, the Central Festival Pattaya Beach Mall, situated in central Pattaya. Pattaya’s bay area is divided into two principle beaches. Pattaya Beach, stretching 3 kms, runs parallel to Pattaya’s city centre and features hotels, restaurants, shops, and various types of bars along Beach Road, which faces the bay. 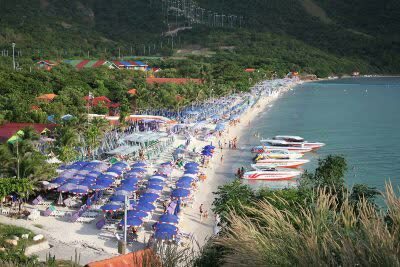 Jomtien Beach is located further south and is more serene and attracts water sport enthusiasts. With a nearby amusement park and tower which entertain children in Jomtien, Jomtien Beach is also more family friendly on a Thai vacation. Separating these two main beaches is Buddha Hill, one of the highest points in Pattaya. The hill’s summit features the largest Buddhist statue found in Pattaya, as well as a Chinese-style sacred area dedicated to Confucius and Lao-zi. Along with its various beaches, small islands, shopping, and vivacious nightlife, Pattaya offers museums, galleries, theme parks, animal attractions, and golf courses, as well as various festivals and events. Pattaya makes a perfect stopover for a memorable holiday on Thailand tours.